- Fahrenheit and Celsius degree selectable. - On, off, hold and / buttons. These dial probe thermometers are pocket-sized and feature a Ø25mm dial with a pointed Ø4mm x 130mm stainless steel stem. They are easy to use and have easy to read dials with a large, clear temperature scale. 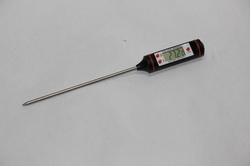 These thermometers are supplied complete with a probe cover. Product DescriptionTemperature checks have never been easier: the testo 831 food temperature thermometer measures the surface temperature of individual products or whole pallets of goods quickly and accurately. 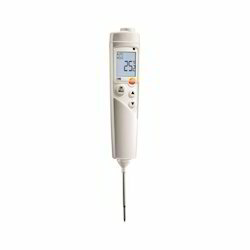 With the precise knowledge of the relevant industry, we introduce ourselves as leading organizations in offering Digital Food Thermometer that can be available in different sizes. Also, these products are offered to the clients within the committed period of time.